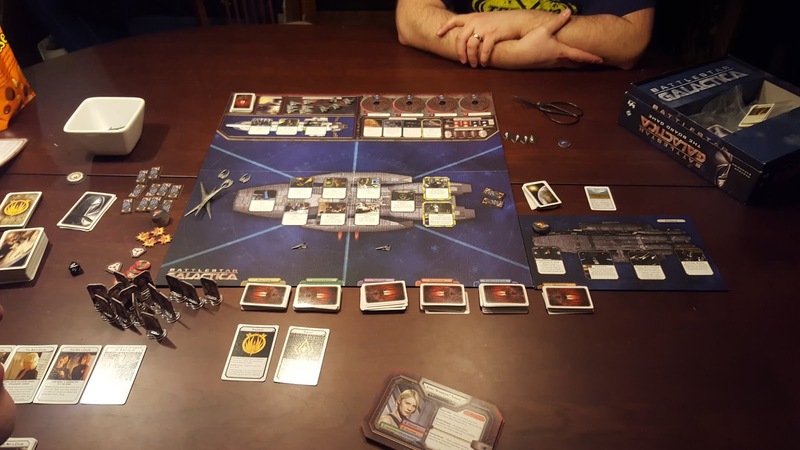 Its been a few year since I've sat down and played Battlestar Galactica, over 5 in fact. Its not that my love for the game diminished, its just that a few other games came up to try like Scythe and Game of Thrones, and a return to Twilight Imperium, and my time for sit down and talk game like BSG is limited. 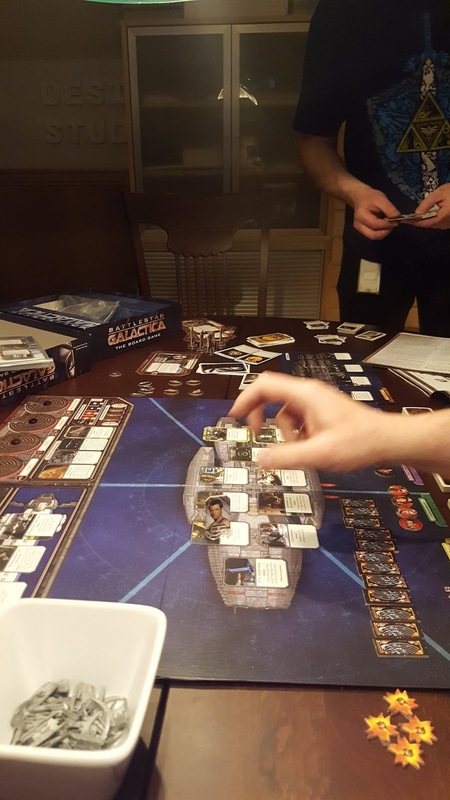 But I got together a crew and made a go of it this past Saturday and it was at once the best and worst game of BSG I've played. 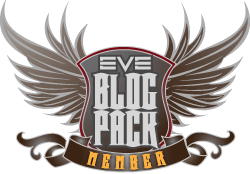 Strap yourselves in for a roller coaster of emotions, accusations, paranoia, and surprises. We were playing the base game with the Pegasus ship, Treachery Deck, and extra characters from the Pegasus expansion. 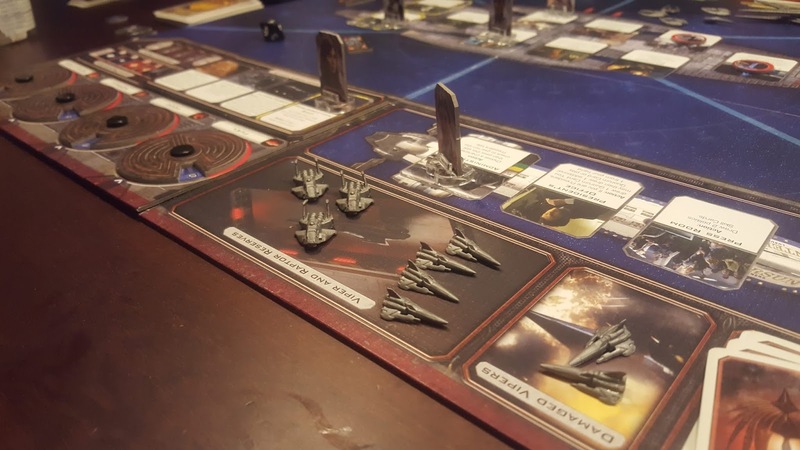 No New Caprica rules, no Cylon leaders, and nothing from Exodus expansion. 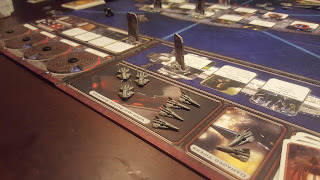 Now in the past I've been a Cylon in 6 of 8 games so I was hoping to not be a Cylon again. 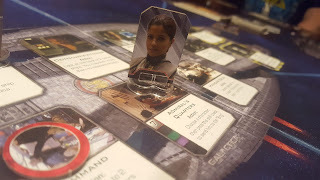 But alas it was my destiny to be a Cylon again as the first round of loyalty cards went out. Sigh. 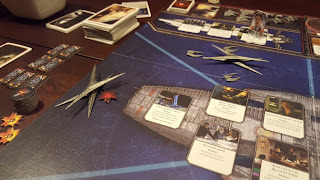 The game started with a bang with a number of crisis cards adding more Cyclon ships and a general feeling of "oh crap" as players went to the engine room on pegasus to increase the jump counter. 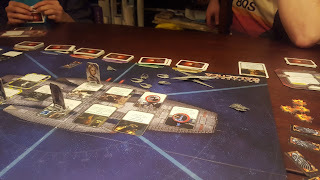 I decided to play quiet Cylon for now and it was a good thing as everyone was very on top of the skill checks and it appeared that no other Cylon player was out there trying to sabotage things. Heavy raider with centurions is almost aboard! We escaped the first major attack without the heavy raiders getting aboard and entered the second phase of the startup: paranoia. Brian using an action to look at the loyalty card of Chad and declaring him human (thank god it wasn't me! ), Chad trying to get the president role from Dave, and me looking at destination cards and trying to avoid the 3 distance ones without making it look suspicious. The skill checks all passed easily as I was trying to keep my Cylon head down and not ramp up the card counting in the checks. I know from experience that much more important checks come later. 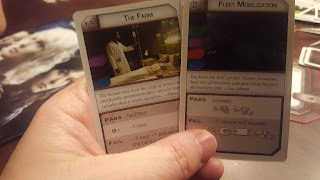 Things are going frustratingly well for the humans as we reach 4 distance and activate the Sleeper phase of loyalty cards... and I get a second You are a Cylon card. 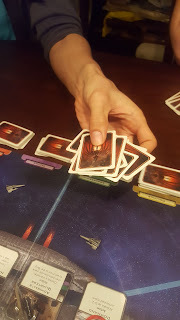 Things are going so well that I know my best option is to reveal and pass my unrevealed cylon card to someone else to increase the suspicions all around. I need help, and decide on Chad as he's a very good logical thinker with a good poker face and giving it to someone else would only turn heat up on them. As a revealed Cylon I got to damage Galactica twice, going for the hanger deck to keep Viper pilots on the ship if I could, and the FTL control to prevent any emergency jumps. 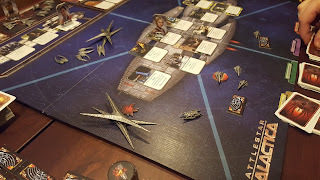 Then I sat on the resurrection ship collecting a couple Super Crisis cards and play the social game trying to get everyone suspecting everyone else. 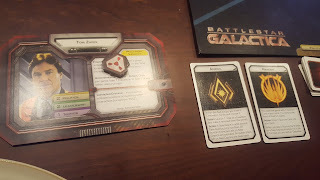 So the humans are still doing ok despite my reveal damage, Chad's wisely playing quiet Cylon trying to deflect and propose that I gave him a You Are a Human card to cover for the other Cylon, and I'm hoping for a chance to frustrate some skill checks while building up my hand of skill cards. A crisis came up for Dave where he either had to give up the presidency or cause Galactica to loose more resources, so he did and Chad became president. 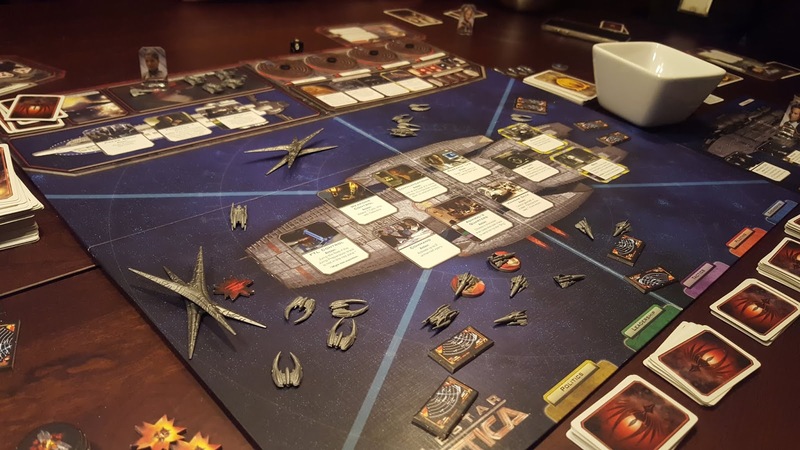 This was some good news for me as Chad is my secret Cylon buddy. And then things got weird. 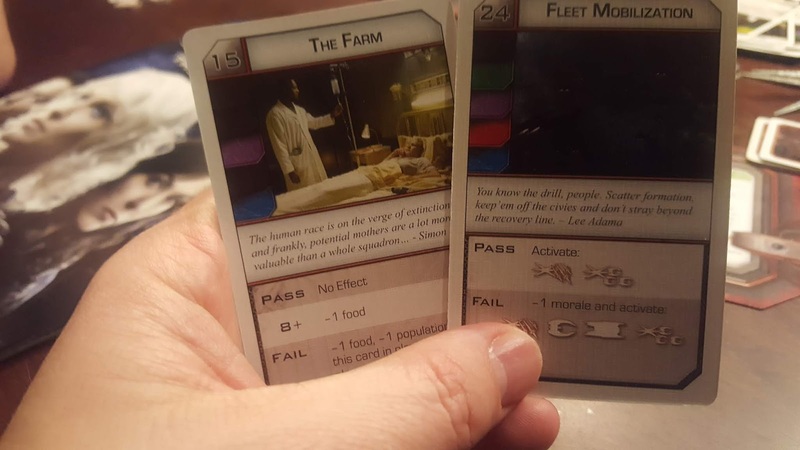 Brian, who became Admiral after I lost it due to revealing myself, looks at the destination cards for a jump and picks one that he says is "the obvious better choice" because its 2 distance, low fuel cost, and oh, hey, makes you pick the Scar crisis card from the deck and play it. "Oops" he says. "I didn't read that part... is Scar bad?" Well, I know Brian's a human but I play it up like he's acting very Cylon-ish with his "mistake" while gleefully placing the Scar ship on the board. 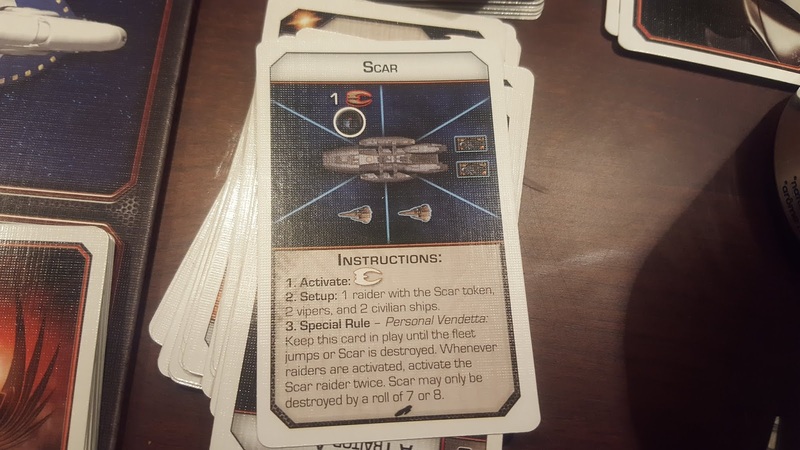 Scar is a raider but only killed on 7-8 on a D8 (unlike normal raiders on a 3+) and activates twice instead of once. That's not the weird part. Ron at this point exclaims that he thinks Brian has outed himself and should be put in the brig. 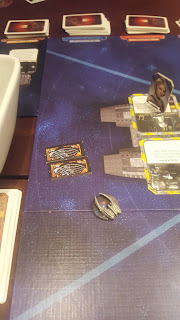 That was strange because in all honesty Scar crisis is not debilitating for the humans, but this is Ron's first time playing so I chalked his reaction up to inexperience. To the brig with Starbuck says Cat!! But then during the check to put Brian in the brig Ron puts in a LOT of skill cards to ensure it, making him look a little more suspicious. I'm loving this! 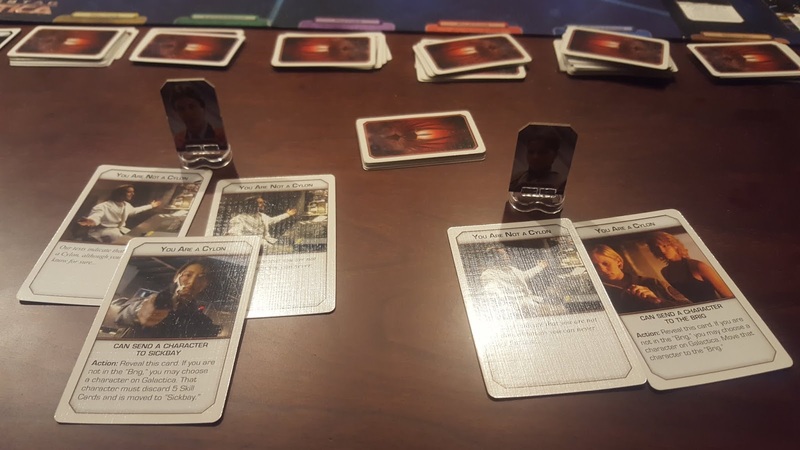 Chad is under suspicion because I gave him my unrevealed card, Brian is under suspicion and in the Brig because of Scar, and Ron's under suspicion because he went after Brian so hard AND became the Admiral once Brian was brigged! Poor Dave! He's the only one not under suspicion and doesn't know who to trust. Paranoia running super rampant now as Ron is accused of being a Cylon and does not defend himself, instead jokingly... or not... saying "ha ha yeah". Um what? 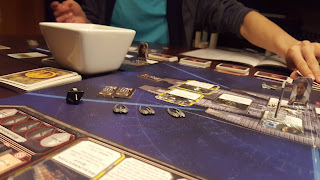 So as a Cylon I'm loving this, I'm spinning all these things as Ron is the Cylon, or Brian, depending on what's happening, and Chad is playing into this suspicion on Ron as it works so well for us Cylons. Ron is under enough suspicion to be brigged and Admiral passes to .... Chad! Who is also the president! 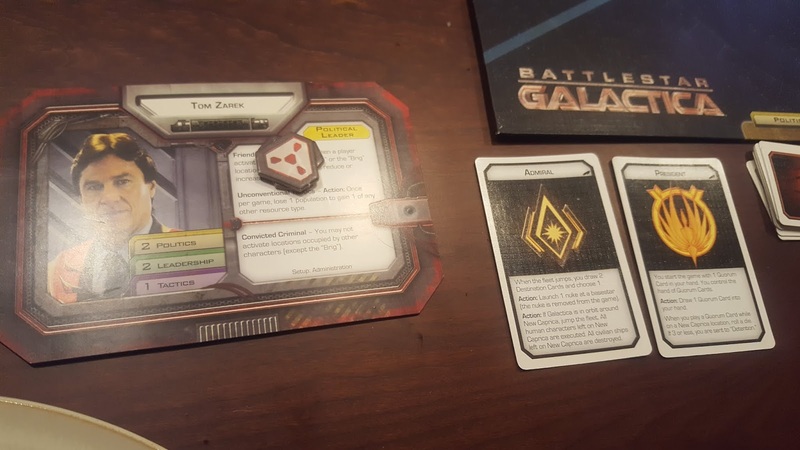 With Brian and Ron both in the brig and only able to contribute one card each to skill checks, things are getting worrisome for the humans. 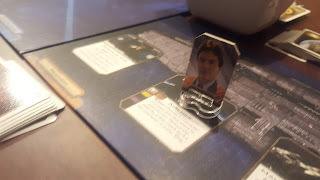 With Chad's prodding Brian and Dave agree to airlock Ron to prevent him from revealing next turn and getting his super crisis card when he's sent to the Resurrection ship. Chad moves to the airlock to activate it and nominates.... Dave. Dave groans and says "well played." Brian is still in shock. Ron looks confused. I'm laughing hysterically. Brian asks to Chad desperately "can you explain your reasoning?" obviously hoping for an explanation to make it all make sense. 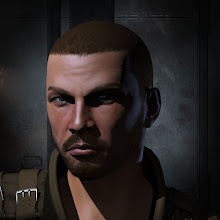 "Well, Brian, I might be a Cylon..." Chad responds. I almost died laughing. I'm thinking we got this, two humans in the brig, one about to be airlocked, the Cylon president and admiral. "Ron," I say through tears of laughter, "are you sure you read your loyalty card right? You acted so much like a Cylon!" He picks up his two cards, looks at them, and says "yeah, I read them right..." still confused. "Ron," I say, not laughing anymore, a terrible realization forming in my head, "do you have a You are a Cylon card?" Everything falls into place. 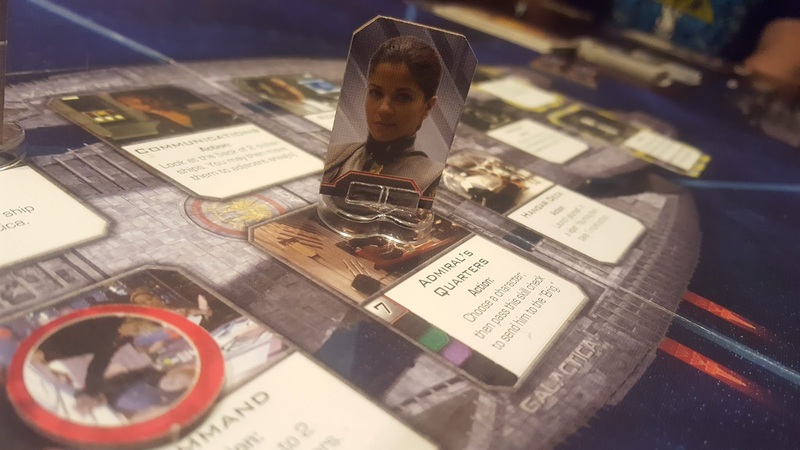 Ron was not a human player playing poorly, he actually WAS a Cylon. He got the card in the sleeper phase just like I did. 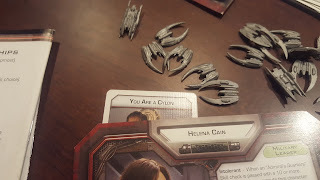 You see, when making the loyalty deck at the start we put in an extra card for the Giaus Balthar character but put in the wrong card, adding an extra "You are a Cylon" instead of "You are human" card. So there was three cards going around and the suspicions against Ron were correct. He wasn't a terrible human player, just an inexperienced Cylon player. We had a good laugh despite the game being botched. I will forever treasure that broken look on Brian's face and Chad's "Well Brian, I might be a cylon" line delivered in the perfect tone of restrained glee. 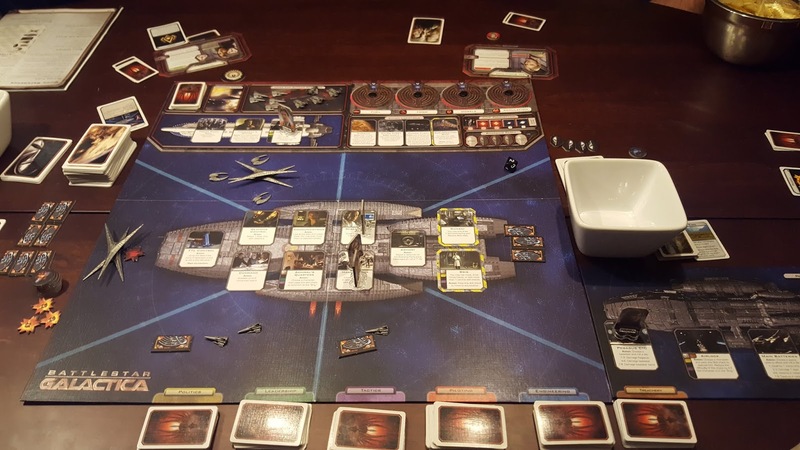 As I said at the start, the best and worst game of Battlestar Galactica I've ever played. And I'm not even mad. 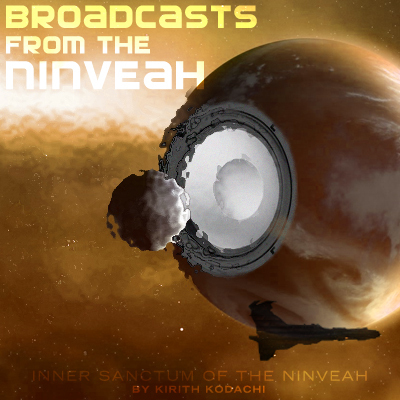 Nice write-up of your game. 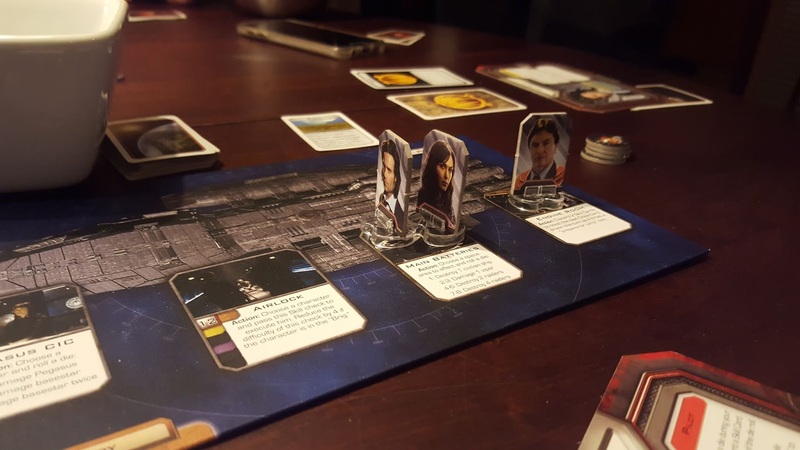 Still considering buying this game because I like the setting and I love idea of one or two players trying to sabotage the game. 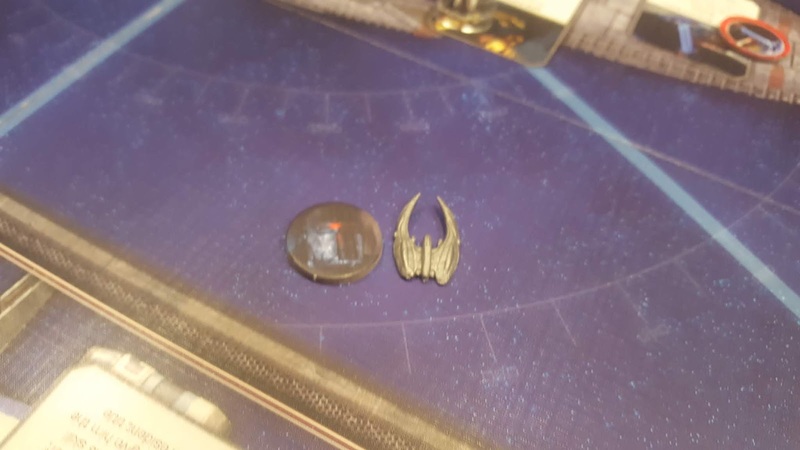 The only drawback is that my gaming group has 4 players which isn't optimal.